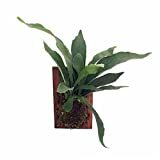 Staghorn Fern Growing on Walnut Wooden Plaque - Exotic Houseplant - 9" x 5.5"
Staghorn Fern Growing on Natural Wooden Plaque - Exotic Houseplant - 9" x 5.5"
Staghorn fern plant for sale is usually a pup divided from a parent plant. You can find ones planted on a pot or mounted on boards. 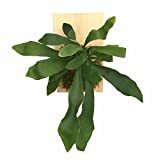 Staghorn ferns are epiphytic plants and grow on trees, rocks, or walls as their natural habitat. 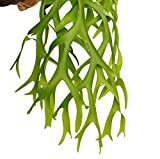 Epiphytes do not feed on other plants but instead gather nutrients from the surrounding air and rainwater. They do not necessarily need soil in order to grow and will thrive if they get low to medium light and moderate moisture. 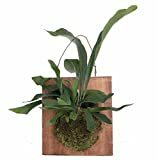 Location – For best growth, outdoor staghorn ferns should be placed in an area with at least 4 – 7 hours of partial shade or low light conditions while indoor plants need bright indirect light. They dislike a hot and dry environment. Indoors, they are usually grown in a basket or mounted on a piece of wood. Place them in a room that has natural light but avoid direct exposure to sunlight. They also do not do well with artificial light. You could also place your staghorn fern on an existing tree trunk in your garden as the tree branches offer midday protection from the sun. 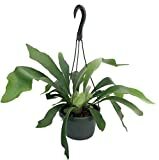 Or you may hang the staghorn fern in a sheltered place outdoors where it will receive moisture from the rain. Soil – Staghorn ferns do not particularly need soil to grow, although they can thrive in very rich but porous soil. This is not recommended. Instead, pile up a little mound of peat, compost or other organic matter under it. You should tie the plant onto the growing medium using a wire or plastic strips. Water – Frequent watering is needed to grow staghorn ferns. Use distilled water for irrigation. Allow the medium to dry out in between irrigations, although hanging ferns are not so easy to overwater. In hot dry weathers, daily watering or misting using a spray bottle is recommended. You can also soak your fern’s root system in a basin for 10 – 20 minutes or until the root ball is saturated. Decrease the watering schedule to about once a month when the fern shows signs of stress, such as wilting or black spots on the fronds or at the base. 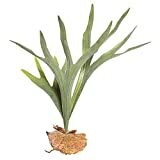 Fertilizer – You may feed your staghorn ferns with fertilizer diluted in water once every month during warmer seasons. Reduce the frequency of feeding to once every other month during periods of dormancy, usually in the fall and winter. However, mature staghorns can survive with only twice a year feedings. Propagation – You may propagate your staghorn ferns by removing the pups from the base of the fern. Mount these pups just as you did with the parent fern. Using spores for propagation is usually not recommended. Diseases – A fungus called Rhizoctonia spp. can infect your staghorn fern due to too much moisture and produce black spots on its leaves. Remove the infected leaves, decrease the humidity level and allow the fern to dry out first before watering again to combat the infection.